Tropical Private Beach-Great Location-Clean-No Stairs-Heated Pool-Wifi-LOADED!!! Only 5 minutes away from many fun activities, great ocean side restaurants. Note: I just listed this property but I have had 2 other properties at this location listed on VRBO-Homeaway since 2009. Homeaway # 243758 and VRBO # 227146. Please read the reviews. Situated on a Private Tropical Beach on the Atlantic our 2 Bedroom, 2 Bathroom condo that is decorated in a Tropical Island theme. The Master Bedroom has a King Size Bed, Master Bathroom and a flat screen TV with cable. The guest bedroom has two double beds and a flat screen TV with cable. The Living room has a 43 inch flat screen TV with cable and Netflix. The condo also has Central Air Conditioning, password protected high-speed internet. The kitchen has corian counter top, dishwasher, microwave and an ice-maker in the freezer. We have a pool, shuffle board, tiki hut will 2 gas grills and 3 tables for dining. We also have green space between our beach and building. We have additional green space along the East side of our property. Our landscaping consists of palm trees and colorful native tropical flowering trees and shrubs. Each condo has it's own parking space marked with it's condo number. We are as close as walking distance to a 5 minute drive to great ocean-side restaurants, kayaking, snorkeling, jet skiing, fishing charters, diving, Dolphin Research Center, Turtle Hospital and State Parks. Feel free to call me if you have any questions. The condo has 2 bathrooms. The hall bathroom has a tub/shower combination. The master bathroom has a full shower. Only a few steps away from our white sandy private beach. Being a first floor 35 yards from our private beach the patio view is partially obstructed by the tropical bushes and flowers. We have central air conditioning. The washer and dryer are in the laundry room next to the pool. They are coin operated. Each condo has it's own parking space with the condo number on it. Our high-speed password protected wireless internet is not shared with any other unit. The refrigerator has an ice maker. We have a dinette that seats 4 and our kitchen corian counter top has a overhang with 2 stools for an additional 2 seats. The living room a 43 inch flat screen. Both bedrooms have flat screens with cable. Living room has a 43 inch flat screen has Cable and Netflix. Both bedrooms has cable. we have a small library of books. The cable TV have assorted music stations. We have a few beach/sand toys. We have Netflix on the big screen in the living room. We have our white sandy beach and a large lawn in front. We also have a large lawn area all along the East side of our property. You can bring your kayak or rent one here. No trailers in the parking lot. We have a bike rack if you bring your bicycle or rent one. We have a local park with 2 new tennis courts and no fees. There is a country club course 5 minutes away and we have a small 9 hole course a block from the condo. This building was build in the 1970's and there are two steps to get to the condo. We have a private pool that is for our complex. There are so many things to do in the Keys, fishing, snorkeling, kayaking, scuba diving, site seeing...and much more. It was a wonderful experience... everything was just as described! Wow! Great vacation! Absolutely beautiful area. The condo and complex were perfect. Mike have great recommendations! The only thing that would have made this better is if we were staying longer! Looking forward to coming back!!! Had a great time. The condo was everything that was advertised. Michael provided information about what to do entertainment and attractions. Provided information very timely. We stayed for a week during our daughter’s spring break. The condo was spacious for 4 people and had many amenities. The beach had a lot of dead seaweed so we’ll probably try a different time of year next time. We will be back! Michael the owner was extremely nice and gave us lots of tips on restaurants and things to do. Many thanks! Great accommodations; very peaceful and quiet! Loved our vacation at Key Colony Beach. Accommodations were as described. Michael sent us a lot of information beforehand with tips of favorite restaurants, etc. That was very helpful and much appreciated. This is a very nice condo in Marathon keys. 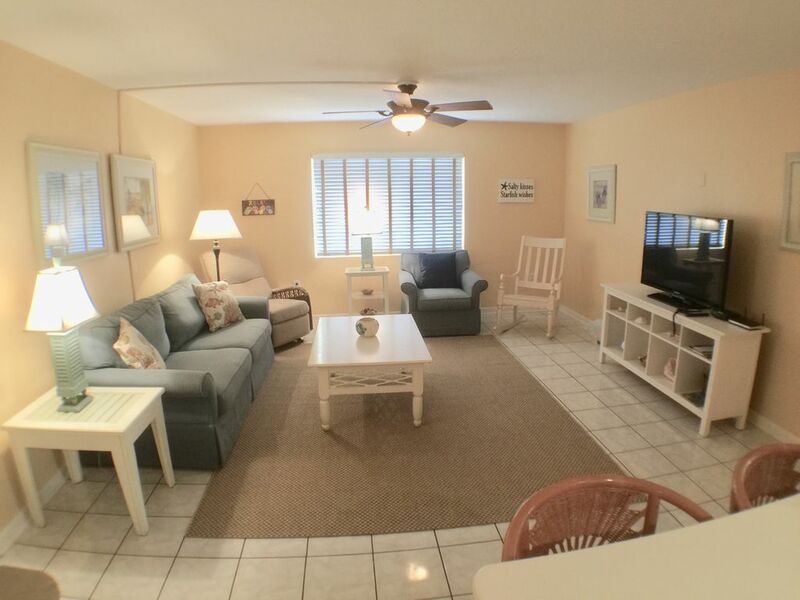 Perfectly located on first floor, next to pool, and steps away from Beach! Beautiful grill area overlooking beach, great location, walking distance from restruants, Marinas and shops, and sunset beach! The BEST part is the owner Michael , is THE BEST! He will return calls text and emails within minutes! A great resource on things to do , places to go. This condo is VERY well stocked with everyday items. Very roomy and very clean. Nice beach and pool area. We have snorkeling, fishing, kayaking, site-seeing, scuba diving...you can sit on our private beach and read a book while you are soaking up the sun. We have many local attractions like the Dolphin Research center, the turtle hospital, kayak tours...many activities for everyone. $100.00 processing fee for a cancellation I rent Saturday to Saturday 60 Day cancellation policy.